The supreme run of success in the Classic trials for the Richard Hannon team continued as Olympic Glory claimed victory in the Aon Greenham Stakes at Newbury. Richard Hughes held his mount up towards the rear through the early stages, with just main market rival Moohaajim behind him. It did look at one stage as though Marco Botti's challenger might be moving much the better, but the 8-11 favourite found plenty for Hughes in the end to run out a comfortable length winner from 20-1 chance Sir Patrick Moore. Hughes, who rode stablemate Toronado to such an impressive success in the Craven at Newmarket on Thursday, said: "He likes the cut in the ground, so France (French 2000 Guineas) might be the better option. "He's lazy, and he's lazy at home, and I gave him a couple of digs just to let him know he had a race. He needs another furlong really." Hannon added: "He never wins by very far, and he is a very lazy horse. He's going to be a much better horse when he goes over a mile. That will take a bit of weight off him and get him ready for the French Guineas. He is still pretty burly and he's bound to improve." 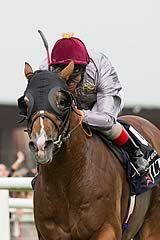 Botti said of third-placed Moohaajim: "The ground is a little bit dead, but he ran a respectable race. We were there to win, but respect to the winner, who is a top-class horse. "We will see how he comes out of the race before we make a final decision about the Guineas."